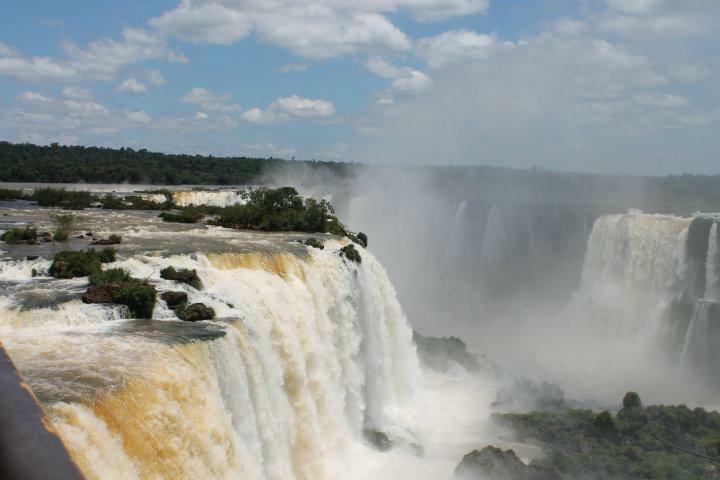 Iguazu Falls, Puerto Iguazu, Argentina - January 22, 2015 - Blog from Foz do Iguaçu, Brazil | South America!! There was a labor strike at the airport today. It brought back memories of our experience in Barcelona about four years ago. The general strike in Barcelona caused us to have one extra day of vacation. Today's strike only caused complication, confusion and delay, but all worked out ok in the end. Our guide, Alex, met us at the Iguazu Airport on arrival and drove us directly to the falls. Even though I was in a bit of a haze when we landed - Stan and both are tired, and I have a cold that is a monster - I couldn't help noticing the blue, blue sky when we arrived at the Iguazu National Park. We have not seen blue sky in months and there surely was no pure blue sky in Rio. The haze was gone and the clear blue sky in all its radiant glory was here at the Iguazu National Park. Mentally, after arriving directly from the airport at the park, I don't think we were quite ready for the experience. We had rain slickers in our baggage, but somehow we didn't get the message. We just dull-wittedly followed our guide. Immediately, we began walking down to the falls getting glimpses of the falls, observing plant, animal and insect life while still in our flying clothes, carrying Stan's back pack containing his laptop, etc. and my purse with all kinds of general poundage. It was surreal and just weird. We were loaded down and getting wetter from mist of the falls by the minute. Still, it was pretty awesome! Iguazu Falls are the widest in the world, a 1.7 miles across the top of the falls. It has over 270 individual falls. The Iguazu River is the border between Argentina and Brazil with the falls on the Argentine side and view on the Brazilian side. Tomorrow we will return to the falls, but we will be ready gear-wise and our experience will be from the Argentine side. The town of Puerto Iguazu is small, quaint and pretty. It has rough, uneven, broken stone streets. Our boutique hotel is modern, very nice and very comfy—we like it. We walked to the super mercado to buy water and wine, of course, but also to look for over-the-counter meds for my raging cold. These poor people! There is no Robitusin, Nightquil, no FibreCon - nothing!!! What do they do without Advil, Excedrin, Tylenol, or how about Pepto-Bismol? As far as we know, no such thing exists in all of Rio de Janeiro and certainly not in Puerto Iguazu. I did find some Hall's throat lozenges. Mary The photos of the falls are breathtaking-based on my experience at Niagara I can envision the roar of the water. Feel better, Janie!